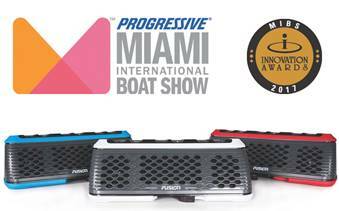 FUSION®, a worldwide leader in marine entertainment, announced today that its STEREOACTIVE purpose-built portable marine stereo has won the National Marine Manufacturers Association (NMMA) Innovation Award in the Watersport Equipment category at the 2017 Miami International Boat Show. 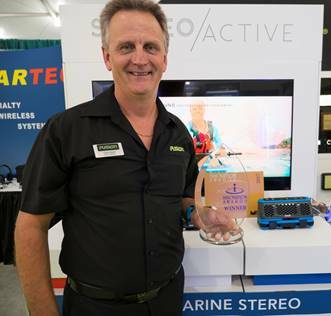 FUSION STEREOACTIVE is the world’s first purpose-built portable marine stereo. With built-in Bluetooth audio streaming, AM/FM radio with weatherband available in the U.S. and USB audio playback, STEREOACTIVE is packed with features. The new compact stereo system is designed for the challenges of life on the water and tuned to deliver crystal clear audio that enhances any activity. Featuring the unique Puck mount system, users can easily and securely attach the stereo to any paddleboard, kayak, canoe, boat or even hot tub. To keep valuables safe from the elements, FUSION has also engineered the ACTIVESAFE, which will securely house any smartphone, vehicle keys, bank cards or loose change. In the unlikely event that the STEREOACTIVE becomes detached from the Puck mount, both the STEREOACTIVE and ACTIVESAFE float, keeping the stereo and valuables safe from the depths below. Engineered to distribute quality audio for a more personalized listing experience, the custom designed speakers, large surface passive radiator, precisely calculated internal volume matched with the Class-D amplifier deliver a powerfully 40 Watts of professional audio. With a long-life battery, STEREOACTIVE will keep music playing for up to 20 hours and can recharge to full power within 3 hours.